Wat Phra Si Rattana Mahathat Woramahawihan : Locally dubbed as “Wat Yai“, the complex is considered the most important temple in Phitsanulok. Housing Thailand’s famous Phra Phutthachinnarat, Wat Yai is located at the foot of Naresuan Bridge on the city side of the river. The temple was built during the reign of Phra Maha Thamma Racha I (Phraya Lithai) in 1357. Phra Phutthachinnarat is considered the most beautiful Buddha image in Thailand. The large Sukhothai-style bronze statue was cast in 1357 by the order of King Maha Thamma Racha I of Sukhothai. The statues unique feature is the flame-like halo a symbol of spiritual radiance. In 1931, King Ekatotsarot (King Naresuan’s younger brother) commanded a gold coating of the image, making it outstanding against the dark backdrop. Today, thousands of visitors, both Thais and foreigners, flock to Wat Yai just to get a glimpse of Phra Phutthachinnarat. Most of contemporary Buddha images are cast using Phra Phutthachinnarat as a model. There is even a saying that, your trip to Phitsanulok is not complete without visiting Wat Yai to pay respect to Phra Phutthachinnarat. 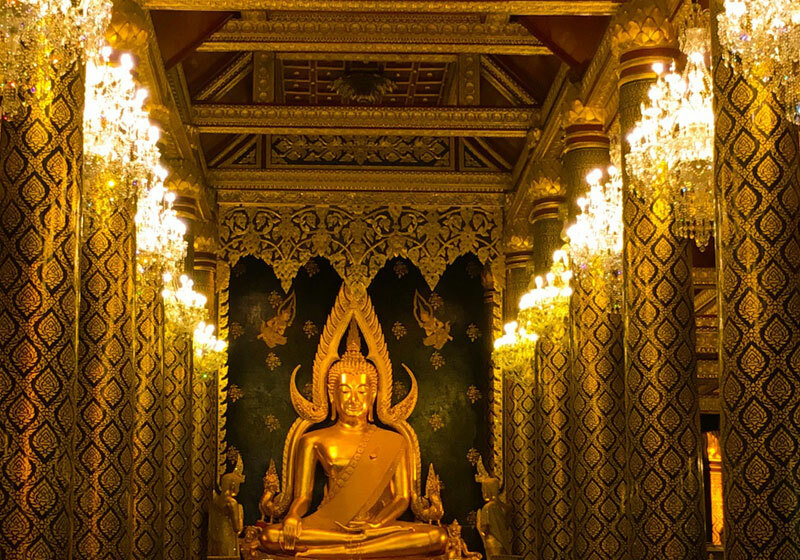 Only the Emerald Buddha situated in the Grand Palace, Bangkok, is more highly respected by Thais. A celebration to honour the statue is held annually in late January. Short Description: Wat Phra Si Rattana Mahathat, colloquially referred to as Wat Yai, is a Buddhist temple in Phitsanulok Province, Thailand, where it is next to the Nan River, near Naresuan Bridge.